We are very happy to announce the launch of our new Embed Form Wizard. 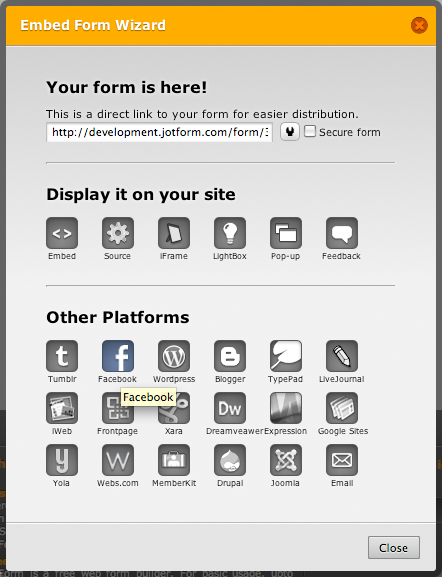 You can now get your forms on popular web editors, blogs and social media pages easier than ever. Each Embed Code is designed and tested specifically for that particular platform. Step by step instruction are also provided with each code. This means you will spend less time adding your forms to your web site. To start using the new Embed Form Wizard, click on “Embed” button on the Form Builder toolbar. You will see a list of most popular web editors, blog engines and social media sites. You will also see options to create feedback buttons, pop-up and lightbox forms. Click on one of the icons to view further instructions. If you would like to suggest any additions to the list of supported editors please post it on the comments below. The form wizard is great and it works...don't like the message presentation though, can that be custamized? Are you planning to use Static FBML? If not I advise you to use iframe code in your TabPress application. You can also put image/s on the top of the form. It is very good. Very user friendly. It all looks and seems to work great. The only thing I've noticed is that the conditions do not work very well when integrated with Facebook platform. Seus dados foram enviados com segurança. Its frustrating having to track down answers to granular questions like that. Other than that- its visual, easy to navigate. I think this is great. I feel guilty because I'm using someone else's code. I do have a question though, after the thank you page, can I have a link that returns the visitor back to the "contact me" page? It seemed to freeze and crash the first 1 or 2 times i used it, but seems fine since. Superb service, thankyou all. It's great: easy to use and very helpful. Thanks! What is my Form ID? I tried adding the form as a Google gadget to my Google Sites webpage, but I don't know what to put in Form ID. This is awesome! I was using other form builders for years, and the embeded form wizard and themes rock! Nice work! It's great! Simple enough for anyone without web design experience to use. Offers plenty of options, and has straight forward instructions. Not enough instructions It is very hard to work out what to do and the forms have not been working on my website. I have tried to fix it several times. I am flying blind. amazing . . . great functionality and design . . . if only all applications could be as grand . . . I love it... especially the LightBox feature. Great addition. The link I copy to my web page doesn't work properly. I LOOVE it! I love the new look of the site as well as the ease of use. It's wonderful! When I use Safari 5.03 I get almost unreadable type under each of the icons. Works fine in Firefox (Mac). I think it's annoying when it comes up with the "custom URL" box when I never clicked on anything for it to do so. I love it.. I just wish You guys had a way to export as a PDF file.. I form I would like to print for person who is not online.. WHAT! lol that's was I said... Old school. When I check secure form, the form is unsecured when submitted. I LOVE IT - VERY EASY AND A GREAT MARKETING TOOL!!!!!!!!!!! I can not get the code to copy into my face book. I'm not sure how to use all this new functionality. I love this bar but when i install it on my site it disables my wibiya bar which i need more than the feedback bar so if there was a way i could have both, that would be great. Don't know what the old one looked like but htis works great! Thanks guys! Absolutely the best form and embed wizard I've ever seen in my life! Thanks and keep up the good work!! It is very Lovely. I hope to use it for Long. FANTASTIC! I'm new to Jot Form, but I'm incredibly impressed! This has saved me a great deal of time and money, and the result is every bit as good as if I had my Web developer create it from scratch. I tried embedding in several different ways using the Embed Form Wizard, and all were successful. its slower that the one before and bit crowded. Bom jogo e se banhe em Riquesas. I love you the team of jot form, you have made my work so easier than expected. I think your form software rocks and hope it brings me a lot of business. One question though, on my paypal checkout, what happened to the return to my site link which I had set up in my paypal account. It's a lot quicker. The prior was a bit annoying, this one is far more effective. Doesn't look amazing, but it works. I do like the hover over on each site, however. Great job! Great idea BUT I user EWxpression Web v1?? and while the page looks good in design mode, it loooks different in preview mode or when published. A small brown square precedes each line. Also, a box displays "should be empty" in the captcha object. I have to use Embed and not see the form in design mode until we resolve this issue. This is a very nice wizard and useful.  Freezes in IE8, but otherwise super nice! You guys rock, thanks for everything! The HTML title is appearing, but the actual fields NEVER POPULATE. Can you remove this off my account for now, and I'll test out next week?! More than happy to be a beta tester!!!!!!! I really enjoy and the various options are great. The embed form feature is great! We use if for Facebook, but it seems like things are loading slowly with the CSS files. Can you check this link out to tell me if you are experiencing the same thing? Loved it....it was VERY easy to use!!!! Thanks for the upgrade. I can't say how great it is. It is actually ALL really excellent. 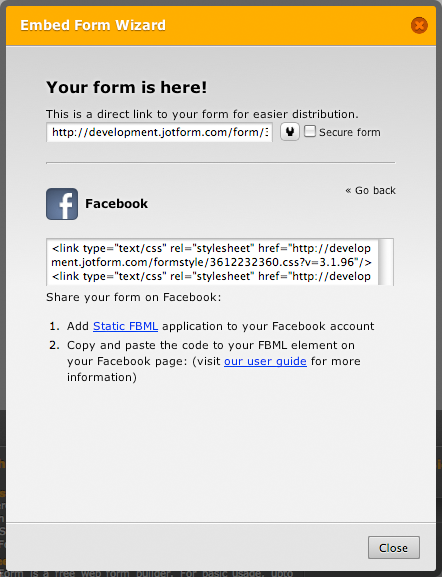 Your form is stored on Jotform site hence the direct link acts a standard url. You can ask your visitors to go to that link either by copy&pasting it in the address bar of their browsers; or you can simplify this process and create a link using different methods depending on your content management system. 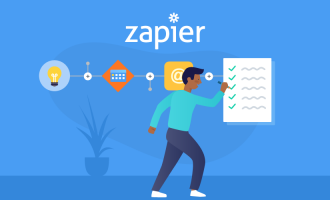 Aside from the technical differences, securing your form is a more reliable way of collecting data in contrast to standard connections, at the expense of a small amount of speed. Though it is not a necessity in most situations such as gathering marketing data or feedback, it is essential if you're collecting rather more personal data such as addresses, telephone numbers, etc. Be aware that secured forms will use the secure submission quota . 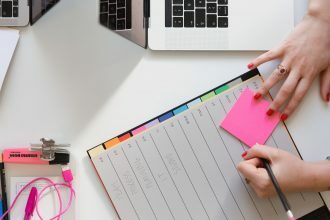 If you can post a question in our support forum with more details, such as your content management system and its version, we can help you further. Can you please elaborate a little more and try clearing your cache? 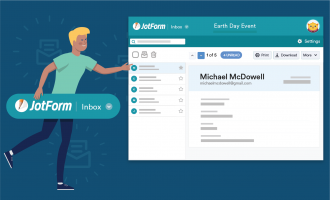 First of all: Jotform is great, Bottomline! Now the bad news:-) The new embed wizard is a bit confusing so I am still embedding my forms the "traditional way" which works just fine. Maybe some additional info on the wizard will change my mind! I absolutely love this wizard. It was easy to figure out my first time on the sight! I like the new form. It is usable and navigable (a la iPad/iPhone...). Why is the simple script embedding not good for Blogger? The old embed form popped up as well...covering the new embed form. I copied the direct link, inserted into my blog, nothing happened. What does secure form mean? what does custom url mean? When I get code from one of the buttons below ( i chose lightbulb) why doesn't the code i put on my blog show up on the blog itself? Why am I always having to deal with mysteries in everything I try? The BEST I ever seen! This is much easier and nicer!!! Keep up the good work! I love it! makes everything easy to find and easy to apply! The "Go back" link could be a little more visible. Other than that... Amazing. Dont know how it works. I love it. Jotform rocks. As the whole website and all the services are excellent, this new form too shows the never-ending work you are doing to develop the system further. Easy to use - thanks. I think it's more easy now.. I mean. More user friendly. Congratulation for a great Job. I love it. I'm from dominican republic and I have tried many application to solved this task, and can tell you without any doubt, you are the best of the best.